Being that Sylphit-Duo is rack-mounted, it fits comfortably into a standard 19-inch 4-post rack, taking up significantly less space than a standard-sized monitor/keyboard/mouse console – only 1¾" (1U). Sylphit-Duo features two exceptionally sturdy, industrial strength nickel-coated slide-out rails, designed to withstand the most demanding industrial hazards. The flat-panel display can be independently pulled out by means of a sliding drawer, tilted-open in a laptop-style and be visible without intruding into the aisle space in front of the rack. The keyboard, touch-pad, and KVM-switch controls can then be pulled out separately. Once interaction with the console's controls is complete, it can get pushed back into the rack, eliminating any intrusion into the space in front of the rack. Pulling out the (lower) keyboard/mouse drawer will make the display drawer pull out in conjunction. For security, the unit has a built-in keyed lock, securing both keyboard/mouse drawer and display drawer in their closed position. Being multi-rack compatible, Sylphit-Duo LCD KVM console drawer can be adjusted to fit deep rack configurations up to 40½ inches. 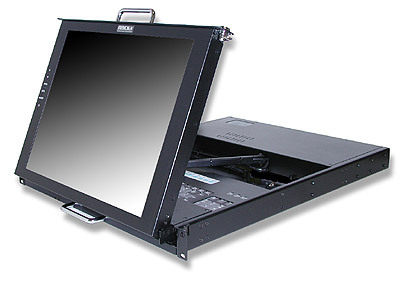 Sylphit-Duo LCD KVM console drawer's monitor is a state-of-the-art LCD device. Its active matrix screen is as vivid as a traditional desktop computer monitor or television screen. Sylphit-Duo LCD KVM console drawer's flat-panel display is made with thin film transistors which are resistant to electro-magnetism, and is protected with anti-glare tempered glass. Sylphit-Duo LCD KVM console drawer's flat-panel display are 17-inch, featuring a large 160/160 viewing angle with 300 nits high-rate brightness, and high contrast ratio 450:1, supporting resolution of 1280x1024. Two separate slide-out rail sets – one for the flat-panel display, and one for the keyboard/mouse and KVM controls. Laptop-style tilting display can be pulled out separately, folded up for video visibility without occupying any space in front of the rack. Pulling out the keyboard/mouse drawer makes the display drawer slide out in conjunction. Only 1U (1.75" high) of 19-inch rack-mount space. High-brightness and high contrast-ratio active TFT LCD flat panel integrated folding display. 17" active TFT LCD display, 1280 x 1024 resolution. Anti-glare tempered glass protects the flat-panel display, adding enhanced visibility. Full 105-keys Windows membrane keyboard, a dedicated numeric keypad, and an integrated touch-pad pointing device. Adjustable rear depth mounting support, up to 40½ inches. Industrial-grade heavy-duty steel construction, with built-in keyed lock, securing both keyboard/mouse drawer and display drawer when folded and pushed all the way in.